With the emergence of many microphone preamplifiers available today, its features become just one of many factors in the decision of using a particular mic-pre. One common feature is the “PAD”. Why do mic-pre’s have a PAD in the first place? 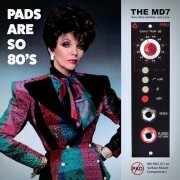 After all, we don’t see a PAD featured in other audio devices. To answer this, we need to look into some details about the common input stage of a mic-pre. Normally, in a transformer balanced mic-pre, the first thing a microphone connects to inside a mic-pre is the input transformer. Although brands may vary, the input transformer is often wound to have a high step-up ratio, meaning, that it adds level to the audio already going into it, and it does this completely passively without the help of any voltage source. So how does the transformer add level passively? It does this by simply doing a trade. The input transformer takes a low level signal with an inherently low impedance and from the ratio of the primary to secondary windings, makes the level higher at the expense of also giving it a higher impedance. It’s classic Ohm’s Law where we are trading current to voltage. If we were to look at it like water flowing from a hose, it would be like trading a thicker hose that has a slower flow of water, to a thinner hose with a much faster flow of water. All along, the actual amount of water coming out of the hose did not change – it only got transformed. The reason why such a high step-up ratio transformer is used in the first place has to do with signal-to-noise. Electricity makes noise as it flows as an electromagnetic wave through a conductor as fast as 50% to almost the speed of light. The oscillation of electrons produce noise which cannot be minimized, unless we achieve the impossible temperature of absolute zero. Noise is complex, and physicists and engineers spend countless hours quantifying it with equations, but our concern is noise that contaminates audio recording. The PAD in a common op-amp type mic-pre is simply a resistive attenuator – three resistors to be exact. Two resistors are in series and one is across them forming a “U” type PAD. Resistor values are chosen depending on how much attenuation is needed and the input impedance. The commonly used input transformer has a ratio of 1:10, and a quick logarithmic calculation reveals that this would provide 20dB of gain. The reciprocal of this gain would be a -20dB PAD which is almost always what you find in most op-amp driven mic-pres. The good thing about having a PAD is that it is a very effective way to lower level if you’re recording in the red. The bad thing is that it is before the input transformer. Why does this matter? Because the PAD will weaken the audio level and this changes the dynamic, although in a small way, with how the input transformer responds to the audio going through it. Without a PAD in the way, you’d be hitting the input transformer with a high level, resulting in harmonic distortion due to the core saturating during peaks, especially at lower frequencies. This imparts something we like about the sound of analog. To put it bluntly, we no longer need a PAD in todays mic-pre’s because the days of tape machine signal-to-noise are gone with digital having noise specifications which are far below anything analog can achieve. So why do we still put a PAD on a newly designed mic-pre? In short, I don’t know but I have a theory. Audio equipment manufacturers today can simply find information online without the need and cost of R&D. Then, all there is to do is enter the schematic into a CAD program, have it auto-routed and, presto – a new preamp. All you have to do is pick some colors and knobs you like and call it something cool – like the Poseidon Pre. What’s the harm? Really nothing, because we’re making audio equipment, not curing cancer, but what this does is slow down innovation in pro-audio. Just look at what percentage of the equipment out there are just reproductions, reissues, or just poor copies of something already done in the past. And I still bite my lips anytime I learn that a new piece has a 600 ohm input or output impedance, which is an old telephone standard and has no relation to audio today… but that’s for another article.